To view the worksheet, please click on the images or copy and paste the URL below into your Internet Browser. You must have an active 10ticks subscription and need to log in to your account to view any of our materials. Cut out the cards and place them around the classroom or just use as a worksheet. Start at any card. 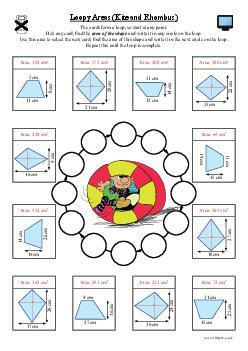 Find the area of the kite or rhombus. This answer will lead to the next card. Stop when you have completed one circuit! This worksheet is aimed at students in Year 8. It will also be appropriate for students in other Year Groups, of a similar ability level. It covers the topic Geometry and measures. We would love to see you and your pupils using this Worksheet of the Week. Please feel free to share any photos you may have of you and your pupils using our resources with us directly on Twitter (@10ticks) with the hashtag #10ticksWorksheetoftheWeek. Please Note: If you choose to share any photographs of materials being used, please ensure that none of the children can be identified, as this may be classed as sensitive personal data, a breach of GDPR regulations. The Twitter app allows you to place smiley faces over any child’s face that can be seen! If you have any questions or need any help accessing the 10ticks Online Worksheet Licence, please do not hesitate to contact us and we will be more than happy to help.